We’d love your help. Let us know what’s wrong with this preview of The Remarkable Courtship of General Tom Thumb by Nicholas Rinaldi. To ask other readers questions about The Remarkable Courtship of General Tom Thumb, please sign up. Long before the fascination with the ‘Little People’ starring in multiple reality shows; there were two mini-celebrities (no pun intended) who paved the way. General Tom Thumb (Charlie Stratton) and Lavinia Warren were performers under PT Barnum during the Civil War era. Despite the country’s upheaval; Charlie and Lavinia achieved stardom and mingled with the top-most figures in history. Nicholas Rinaldi brings their story and marriage to life in, “The Remarkable Courtship of General Tom Thumb”. Long before the fascination with the ‘Little People’ starring in multiple reality shows; there were two mini-celebrities (no pun intended) who paved the way. General Tom Thumb (Charlie Stratton) and Lavinia Warren were performers under PT Barnum during the Civil War era. Despite the country’s upheaval; Charlie and Lavinia achieved stardom and mingled with the top-most figures in history. Nicholas Rinaldi brings their story and marriage to life in, “The Remarkable Courtship of General Tom Thumb”. There is no denying the writing skills of Nicholas Rinaldi concerning the infusion of “The Remarkable Courtship of General Tom Thumb” with vivid descriptions and illustrated visuals. The test sparkles and shines, without a doubt. Yet, there is a chunky dissonance to the story which causes the novel to fall flat. First of all, “The Remarkable Courtship of General Tom Thumb” is told in a past-tense voice with the events being expressed as memories instead of truly living them with the characters. This results in a huge gap between the reader and Charlie; preventing one from really getting into his head. There is also an issue with Rinaldi seemingly not knowing the theme to his own novel. Much of the text focuses on the Civil War and although this is detailed and passionate; it feels unrelated to the real crux of Charlie and Lavinia. The transitions between these subplots are not smooth and therefore feel like separate novels. There are also moments when the plot (and text) feels too modern. Although these are not excessive; they are very noticeable and are therefore jarring to the reader. “The Remarkable Courtship of General Tom Thumb” falls more into place around page 100 when Rinaldi begins to alternate voices between the two characters with respective chapters being told by each. Lavinia’s characterization is actually more developed than Charlie with a stronger voice and more openness even though Charles is the main character. Halfway through, the plot thickens slightly and the pace increases making the novel much more readable (and enjoyable). On the contrary, though, something is still ‘missing’ with an absence of truly revealing the characters. This can best be described in a sort of nonfiction way. Meaning, that Rinaldi could probably pen a strong, unbiased, nonfiction piece better than a novel requiring creativity. The major issue with “The Remarkable Courtship of General Tom Thumb” is that instead of becoming better, the story becomes very repetitive and unbelievable as the pages progress. I have read much about the characters previously and Rinaldi took quite a lot of historical liberties. As this is a HF novel; Rinaldi reserves that right but at least the events could have been more life-like versus silly and impossible. The concluding chapters of “The Remarkable Courtship of General Tom Thumb” are rushed and inconclusive leaving many unanswered questions. The ending is not as memorable as Rinaldi hopes it to be. There is a very brief (about 4 lines) mention of the historical liberties in the author’s “acknowledgements” which frankly is quite disappointing at the lack of detail. “The Remarkable Courtship of General Tom Thumb” is simply not enthralling and isn’t what it sets out to be as it is barely a novel on Tom Thumb. On the contrary, it is more of a Civil HF so if that is your forte; then by all means read this novel immediately. Sadly, the true voices and lives of the characters are never properly revealed. My suggestion for a much better HF novel on the subject is The Autobiography of Mrs. Tom Thumb. On the plus side, the novel is a quick 1-2 read so it doesn’t take up much time. What happens when you get P.T. Barnum, President Lincoln, Walt Whitman, Ulysses S. Grant, The Queen, and John Wilkes Booth all in the same book? Oh, and a dwarf—two of them. Well, it should be really interesting, right? Publishers Weekly called it, “Top-notch entertainment”; Booklist called it “Rollicking”. I’m not sure which book they were reading, because this book could have been SO. MUCH. MORE. Reading this, I’m kicking myself for not have visiting the Barnum museum in Bridgeport yet. I spent What happens when you get P.T. Barnum, President Lincoln, Walt Whitman, Ulysses S. Grant, The Queen, and John Wilkes Booth all in the same book? Oh, and a dwarf—two of them. Well, it should be really interesting, right? Publishers Weekly called it, “Top-notch entertainment”; Booklist called it “Rollicking”. I’m not sure which book they were reading, because this book could have been SO. MUCH. MORE. Reading this, I’m kicking myself for not have visiting the Barnum museum in Bridgeport yet. I spent most of this book on Google digging out the true story of General Tom Thumb and P.T. Barnum and the Civil War. Yeah, that’s a great thing about historical fiction: It’s a great learning experience. It’s all a testament to the book itself. It wasn’t “fast-paced and brightly colored” as Kirkus said; it was more ho-hum and grayish-dull. Again, could have been SO. MUCH. MORE. The author Nicholas Rinaldi has three collections of poetry that sound interesting, so I was looking forward to what the New York Times Book Review called “sprawling and elegant”. I really don’t make a habit of calling out and questioning other reviews, but when they are all over the product page…I kind of need to. Nothing aggravates me more than thinking the consumer is being duped (false author book blurbs are a big pet peeve of mine). If I was to call a book “sprawling and elegant”, even poetic, I would refer to ALL THE LIGHT WE CANNOT SEE, also published by Scribner this year. That work was an excellent piece of historical fiction that really made me feel something. Sadly, Tom Thumb did not entertain me the way he should have—the way he entertained thousands of people in real life. Thank you Scribner for providing this book electronically for me to review. 3 stars, but it's a stretch. Rounding up. As a child I recall the movie Tom Thumb and on occasion, have read bits and bobs about him. I truly did not know much about his life and this book gives some poignant insights. It is not by any means a biography. Mr. Rinaldi states that very clearly. However, he has taken much of what is known about his life and then embellished to make a fascinating study of the times as well as what life was like for a little person in the 1800's. His was a life of great successes, wealth, fame as well as frust As a child I recall the movie Tom Thumb and on occasion, have read bits and bobs about him. I truly did not know much about his life and this book gives some poignant insights. It is not by any means a biography. Mr. Rinaldi states that very clearly. However, he has taken much of what is known about his life and then embellished to make a fascinating study of the times as well as what life was like for a little person in the 1800's. His was a life of great successes, wealth, fame as well as frustration. PT Barnum made him an international celebrity but also ran all the aspects of his life. One can only imagine how complex his emotions must have been to be seated on the laps of Queen Victoria and others or to be tossed about like a doll by others. Until his future wife, Vinny, joined Barnum he was also highly frustrated in love. Despite the fact that Barnum set this up just as he set up so many of the events in Tom's life(or Charlie to be more accurate), it was a deep and abiding love they shared. If you think the entire book is dedicated to the courtship of the two, you would be mistaken. It covers both Tom and Vinny from their pre-Barnum days to their marriage and their observations and involvements in events of the Civil War. It is quite a different vantage point than any I have read before. Particularly memorable are the letters Vinny's regular sized brother sends to Tom from the battlefields where he fights. The parts where the two go from bystanders to participants in the turmoil are also thought provoking. This is a book that a student of the Civil War or life in the mid 1800's will enjoy. It has whet my curiosity to learn more about this remarkable man. I really enjoyed this story set in the civil war period. I knew almost nothing about Tom Thumb and only associated PT Barnum with the Barnum & Bailey Circus. Nicholas Rinaldi did a great job setting the story and providing a full, colorful backdrop of the period. I'm looking forward to reading his other works. Great story with several high-profile characters. 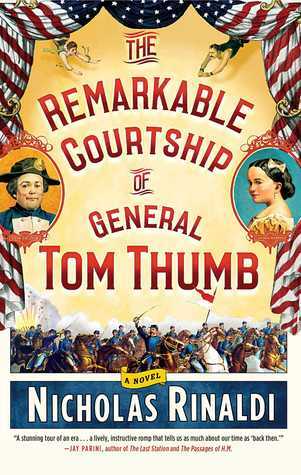 The Remarkable Courtship of General Tom Thumb by Nicholas Rinaldi is a free NetGalley ebook that I read in late May. Thought I had read this book before, but, no, that had been a Melanie Benjamin book (The Autobiography of Mrs Tom Thumb). This, in a somewhat similar way, is wistful and nostalgic with Tom/Charlie being employed at age 5 (though advertised as 11) and witnessing wondrous sights and experiences, alongside the tumultuousness and tension of the Civil War. Mind you, this is also a stor The Remarkable Courtship of General Tom Thumb by Nicholas Rinaldi is a free NetGalley ebook that I read in late May. The primary focus of this book is to describe the civil war through the eyes of Tom Thumb. It is a fictional novel which I expected to focus more on the relationships of Tom Thumb. As a story about the civil war it restated what I already new. From a historical fiction standpoint, I enjoyed the author's depiction of Civil War history through the memories of Tom Thumb. The story was told in the format first person, past tense -memories- and it felt as though the author rambled through the book with no particular point or end. I know little of freak shows or P.T. Barnum, other than the circus. My exposure to little people came first from The Wizard of Oz as a child--pretty exploitive, I'm guessing--, and, more recently, the reality show Little People, Big World. So a historical novel about General Tom Thumb of P.T. Barnum's great museum in New York City sounded interesting. Author Nicholas Rinaldi alternates the voice of Charles Stratton (aka Tom Thumb) and his wife Lavinia Warren. We meet Charles Stratton at age five when P.T. Barnum approaches his parents, wanting to exhibit the little boy at his American Museum. With few prospects--no special education, no Americans with Disabilities Act--Charlie's parents sent him off with Barnum, father in tow as chaperone. Stratton has a (link) by well over 150 years. The conceit of Nicholas Rinaldi's novel is that Charles Stratton, as Tom Thumb, acted as a Union spy during the civil war. Tom Thumb's extensive travels (one tour was estimated to be over 55,000 miles by land and sea) provided the perfect cover. So in Rinaldi's world, Tom travels, meets and greets his admirers, and every so often is given an envelope with the pass word, "Greenwood" and then passes it along to a courier. Interesting idea. Totally fiction from what I could read online. But perhaps most disappointing of all, never really explored by Rinaldi, other than the pick-up and drop-off. The novel is full of walk-ons by an incredible number of important people in the 1860s: Walt Whitman, John Wilkes Booth, Abraham Lincoln. But the writing reads more like a history book or encyclopedia than a novel, and the incredibly colorful characters remained wooden and flat. For charming, read this account of Tom Thumb and his wife, Sketch of the Life. Personal appearance, character, and manners of Charles S. Stratton, the man in miniature, known as Tom Thumb (link) written in 1874. It's the "account of Remarkable Dwarfs, Giants, and other Human Phenomena, of Ancient and Modern times". I think you'll be just as satisfied as reading this novel. Disclosure: I received this novel for free through a Goodreads' First Read's giveaway. I have mixed feelings about this novel. A large part of these mixed feelings stem from my not knowing what could be true, what is true, and what is completely made up. In general, I tend to prefer books that are actually true, rather than historical fiction works, but I thought I would give this one a try, since the subject matter is interesting. So while I did find the overall storyline itself interesting, I Disclosure: I received this novel for free through a Goodreads' First Read's giveaway. I have mixed feelings about this novel. A large part of these mixed feelings stem from my not knowing what could be true, what is true, and what is completely made up. In general, I tend to prefer books that are actually true, rather than historical fiction works, but I thought I would give this one a try, since the subject matter is interesting. So while I did find the overall storyline itself interesting, I couldn't help but be distracted throughout by thoughts of 'I wonder if that's true...'. I had a basic knowledge of Tom Thumb and P.T. Barnum before picking this up, and reading this novel has sparked my interest in learning more about them both. I did not know how much of a hand Barnum had in Tom's day-to-day existence, and I never really considered what Tom's life must have been like as a result. The relationship between Tom and Lavinia Warren is a focal point of the novel, as the title would suggest, but much more happens throughout. The reader learns about Tom's relationships with others who work for Barnum, Barnum himself, etc. Also presented is information about his tours, his rivalries and his own personal likes and dislikes. But, again, how much is true and how much is pure fiction? Tom plays a role during and immediately following the Civil War, and that is one thing I would love to learn more about. However, I'm not going to go into detail here, as I don't want to ruin it for someone else. If you choose to read this novel, then you'll know exactly what I am talking about. The reviews for this one seem to be all over the map but I am enjoying it. Perhaps it's just where this book falls in my reading life that has made it pleasurable or perhaps it is because I feel like I've read too few books about the Civil War and I'm enjoying filling in some of those gaps. Either way, I have found the narration to be light without feeling fluffy and the depictions of the war to be personal (enough) without being depressing or overdone. As I said above, maybe this is just The reviews for this one seem to be all over the map but I am enjoying it. Perhaps it's just where this book falls in my reading life that has made it pleasurable or perhaps it is because I feel like I've read too few books about the Civil War and I'm enjoying filling in some of those gaps. Either way, I have found the narration to be light without feeling fluffy and the depictions of the war to be personal (enough) without being depressing or overdone. As I said above, maybe this is just a case of "the right book at the right time" but liked this book and would recommend it to people who enjoy historical fiction. Rinaldi makes it clear in the acknowledgements that this is a work of historical FICTION and that while he researched the Civil War, PT Barnum, and especially Tom Thumb, there are times where he placed Tom Thumb and his wife Lavinia (Vinnie) into historical situations which they were NOT part of. Where Tom and Vinnie did tour through Kentucky during the Civil War, for example, they weren't necessarily in the town ransacked by the Confederate Army at the time that it was ransacked. I liked this book, enjoyed reading about the Civil War. Lavinia has a brother, Benjamin, who is fighting for the North in the war and there are periodic letters home which report about the war from his point of view. There's the colorful story of PT Barnum's museum (which I never knew about before this book) and also how Barnum came to create the traveling circus that I know as his legacy. Tom Thumb and his wife Lavinia are great characters and the story is well narrated from their first person point of view. Who is the world’s most famed entertainer during the Civil War era? John Wilkes Booth may come to mind, but his contemporary, Tom Thumb, is the name on everyone’s lips. Born Charlie Stratton, the lad was twenty-six inches long at six months, but never grew another inch until he was in his mid-teens. Dwarfism is no curse for Charlie, who is raised to stardom by P.T. Barnum. The showman dubs his four-year old performer “General Tom Thumb,” and Tom’s first role is Baby Jesus, who leaps out of his m Who is the world’s most famed entertainer during the Civil War era? John Wilkes Booth may come to mind, but his contemporary, Tom Thumb, is the name on everyone’s lips. Born Charlie Stratton, the lad was twenty-six inches long at six months, but never grew another inch until he was in his mid-teens. Dwarfism is no curse for Charlie, who is raised to stardom by P.T. Barnum. The showman dubs his four-year old performer “General Tom Thumb,” and Tom’s first role is Baby Jesus, who leaps out of his manger to dance. Soon Tom is touring Europe and meeting royalty. Public interest in Tom Thumb soars when Barnum brings the even tinier Vinnie Warren to his museum of curiosities. It is love at first sight for Tom and Vinnie, who marry in 1863 in a lavish ceremony staged by P.T. Barnum – who sells $75 tickets to their reception at the White House. The wedding serves as a welcome distraction for Americans weary of the bloody Civil War, and the couple is the Kanye West and Kim Kardashian of their day. Tom Thumb sat on Abraham Lincoln’s lap, and met generals, politicians, and other famous folk, including John Wilkes Booth. This makes Tom a unique observer of that pivotal time, and the award-winning Nicholas Rinaldi uses Tom and Vinnie to bounteous advantage in The Remarkable Courtship of General Tom Thumb. Rinaldi presents readers with the side show in vivid fashion, and adds fully imagined characters, a highly public love story, and a book which will enthrall you. Generally I tend to only offer a review on books I love and recommend. I blame very tough grading teachers in my English classes leaving this STEM type sure that I am probably missing something and it is not the author's fault for that. Only because a friend ....who is a prolific reader and finds time in her very busy family and community life to write extensive, insightful reviews on EVERY book she picks up ....let me know it was NOT okay to just slap stars down here with no remarks, I am back t Generally I tend to only offer a review on books I love and recommend. I blame very tough grading teachers in my English classes leaving this STEM type sure that I am probably missing something and it is not the author's fault for that. Only because a friend ....who is a prolific reader and finds time in her very busy family and community life to write extensive, insightful reviews on EVERY book she picks up ....let me know it was NOT okay to just slap stars down here with no remarks, I am back to submit this review. So, 3.5 stars actually....with some credit for a lovely, enticing book cover. That's a thing for me... I am a visual, tactile book reader who probably will never pick up a Kindle to read. I'm sure I am outside the norm in having interacted as a child with retired vaudeville "little people" so that would certainly influence my reaction to the book. Also, I was aware of the shocking numbers of killed and wounded soldiers in the Civil War as well as that 'sport/entertainment' thing they did at that time in piling in the carriage to go picnic on the hill watching a battle!! This book was an enjoyable, engaging read.... although a bit of a stretch in believability in some aspects ,with some repetition, and characters left a little flat so at the end I was disappointed. I read no more than one chapter at a sitting to stall ending it. Very exciting read for me with the danger, intrigue and espionage, riots, war and the beautifully quilted plotting. Good defense of Whitman poetry by Tom. "The lines come rushing in at you like rushing waves." Minnie and her sharp tongue are a joy! Damned interesting characters. Much applauding going on beneath the "leaves of grass" at Mountain Grove. But the sky, that was something else. And Zatagatooz—I knew I read no more than one chapter at a sitting to stall ending it. Very exciting read for me with the danger, intrigue and espionage, riots, war and the beautifully quilted plotting. Good defense of Whitman poetry by Tom. "The lines come rushing in at you like rushing waves." Minnie and her sharp tongue are a joy! Damned interesting characters. Much applauding going on beneath the "leaves of grass" at Mountain Grove. But the sky, that was something else. And Zatagatooz—I knew all about that. It was everything that was inside out and upside down, everything strange and hard to figure—things bent and curled, snarly and unexpected. Life is wrinkled and it does confuse. Yet I came to see that sometimes, oddly, awkwardly, it could be fun—full of bonbons, galloping horses, cherry trees, and crowds of people applauding as if you were some kind of god, even though you were just you. The days and months flipped by, and suddenly at seventeen, I found myself in a year that was like a box of broken crackers—and near the end of that year , at the bottom of the box, nothing but maggoty crumbs. The premise of this book was intriguing – two dwarves (well, I suppose four) touring America during the Civil War. With PT Barnum at the helm, no less. I have to admit that I've always been fascinated with the psychology of the circus and “freak shows.” But the plot only skimmed the surface and since it was in first person, fell to the trap of being too introspective. Sure, I knew what the main characters were thinking, but I didn't feel like it led anywhere significant. The main problem, I think, was lack of dynamo. And by that, I mean a driving force, a reason to move forward and keep fighting. The characters traveled all over the place throught the novel, but as far as development, seemed to be running in place. I enjoyed the questions this book posed about war, identity, and life; just wish it had gone further. The Remarkable Courtship of Tom Thumb is a historical novel focusing around the Civil War as seen from the perspective of Tom Thumb and his bride, dwarf performers for Barnum (as in Barnum and Bailey/Museum of Freaks). This is something that I expected to find fascinating, as I love reading about performers (especially those on the fringes of "normal" society), historical fiction (especially periods about which I know little, the Civil War being one of those periods) and elements of romance. Unf The Remarkable Courtship of Tom Thumb is a historical novel focusing around the Civil War as seen from the perspective of Tom Thumb and his bride, dwarf performers for Barnum (as in Barnum and Bailey/Museum of Freaks). This is something that I expected to find fascinating, as I love reading about performers (especially those on the fringes of "normal" society), historical fiction (especially periods about which I know little, the Civil War being one of those periods) and elements of romance. Unfortunately, it did not live up to my expectations. It is fantastic as a historical novel about the Civil War, however, it falls down hugely on the romance elements - a shame for a book that has "courtship" right there in the title. The courtship was the smallest element of the book, with the early life and married life of Tom Thumb being far more of a focus. The author includes other interesting characters that were apart of the side shows at the Barnum Museum. It got better as it went on. Tom Thumb was pretty much annoying in the first few chapters. Their courtship was pretty brief, but I guess, "The Remarkable Story of Tom Thumb, Lavinia Warren, Their Marriage and Adventures During the Civil War" would have been way too long to put on a book cover. Barnum's Museum sounds amazing. I would have liked to have seen it. I also confess, I kept hearing the voices of The Little Couple in place of Tom and Vinny in this story. I enjoyed the story about General Tom Thumb and his wife. Read those parts straight through but found myself skipping through Civil War details. I have read many fiction and nonfiction accounts of the period and those descriptions were too familiar. When the author returned to the tours and the unique characters surrounding General Tom Thumb, I was glad that he did. I enjoyed learning about Tom Thumb (I wasn't even sure he was a real person before) and reading a lot of material that I did not know about the Civil War. The writing just didn't "draw me in". I really enjoyed this book. I learned a lot about the Civil War from the perspective of what was going on outside the war - something you don't often see.